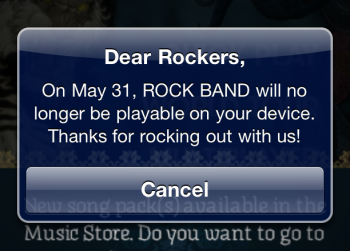 Electronic Arts says the iOS Rock Band shutdown notification was "sent in error." Word went out yesterday that Electronic Arts, AKA the worst company in the universe, had decided to pull the plug on the iOS version of Rock Band. Upon starting the app, users were greeted with a pop-up messages warning them of the coming shutdown, scheduled to take place on May 31. That in itself is bad enough, but what made the situation really ugly is that EA was continuing to sell the game at full price, despite the looming closure. But it turns out that the whole thing was a mistake, although why it happened remains a bit of a mystery. "Rock Band for iOS will remain live - the in-app message users received yesterday was sent in error," EA said in a statement sent to Cnet. "We apologize for the confusion this caused. We're working to clarify the issue that caused the error and will share additional information as soon as possible." I'm not entirely sure what the loss of "connected features" means, but an FAQ regarding the situation, which has since been removed but is still available via Google cache, certainly makes it sound like the loss of connectivity means the complete loss of the game. "The Rock Band servers will be live through May 31, 2012," it said. "If you have already downloaded the game, you can continue to play until then." Loss of the game notwithstanding, that's the real problem here: we still don't really know what's going on. This mess may have started with a mistake, but rather than correct and clarify, EA seems to have just muddied the waters even further.